“What were you thinking of getting me for my birthday?” I answered, and then explained that he was the number one candidate should I need bone marrow for a transplant. He got me a bottle of Champagne instead; I didn’t need that transplant after all. Yet I always wondered what would have happened if his bone marrow wasn’t a match. Then what? Perhaps a Swab Party. 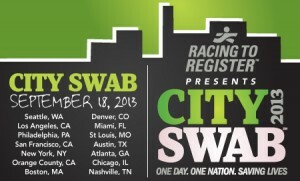 This Wednesday, September 18, Delete Blood Cancer will team up with Racing to Register to host City Swab Parties in 15 cities across the U.S. for the first coast-to-coast bone marrow donor drive. The goal is to increase registration in the National Bone Marrow Registry, which matches patient with donors, to give more patients more hope. According to Delete Blood Cancer, six out of 10 patients never receive the live-saving bone marrow transplants they need, despite a registry of millions. To change this, more donors with more ethnicities are needed. And it starts with a simple cheek swab. If you’re 18-55 and in general good health, drop by a City Swab party on Wednesday or contact Delete Blood Cancer to find a donation site or host your own party. You sign up for the registry, swab the inside of your cheek with two Q-tips, and the results are analyzed for markers. Doctors search the registry for markers that match their patients. If yours is a match, you go to a local collection center, usually an accredited hospital, where, 80% of the time, your bone marrow is collected through your arm. Donors received daily injections of a protein called filgrastim for four days before and on the day of the collection. Then blood is drawn through a needle in one arm, passed through a machine that separates out the blood stem cells, and the remaining blood returns to the donor’s body. You don’t lose blood in the process. Some donors feel flu-like symptoms like headaches, bone and muscle aches and fatigue, but those side effects generally subside within 48 hours. Ruppel says, “You are called because there is a patient in need.” Your donation is never used for experimental purposes. 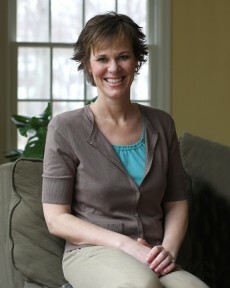 Sometimes, patients and donors meet (only after the one year required by U.S. law.) “We call that ‘the meeting of the match,'” says Ruppel, who recalls many emotionally touching meetings of the patients and the donors who saved their lives. She says that moms are an important part of getting the word out for the need for donors to join the bone marrow registry. Next Entry: But What About My Cancer Awareness Month?